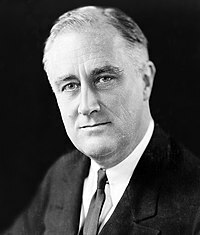 B'é Franklin Delano Roosevelt (30 Eanáir, 1882 – 12 Aibreán, 1945) an 32ú hUachtarán ar na Stáit Aontaithe ó 1933 go dtí a bhás i 1945. Bhí sé ina bhall den pháirtí Daonlathach. Bhí ceithre théarma Uachtaránachta ag Roosevelt i ndiaidh a chéile, níos mó ná ag aon uachtarán eile. “Is é an t-aon rud ar chóir dúinn eagla a bheith orainn roimhe ná an eagla féin ... Tá na mílte dár saoránaigh dífhostaithe agus fadhb mhór rompu amach .. , gan aon toradh ar a gcuid iarrachtaí ... Ach ní easpa acmhainní is cúis lenár n-ainnise. Tá flúirse i mbéal an dorais againn ach tá ag teip orainn leas a bhaint aisti ...”. Ceann de scéimeanna Roosevelt ná damba millteanach mór a thógáil ar abhainn na Tennessee chun leictreachas a sholáthar. Tugadh an Tennessee Valley Authority (T.V.A.) ar an dream ar cuireadh cúram a thógála agus a reáchtála orthu. ↑ Cowman, Des (1991). Fianaise na Staire Iml. 3 : Gnéithe de Stair an 20ú hAois, Ar dTuiscint ar an Domhan Nua-Aoiseach, leathanach 67 (An Gúm). Tugadh an leathanach seo cothrom le dáta an 6 Bealtaine 2016 ag 16:13.